The beautiful Old Town is less than a mile long. You can go everywhere on foot. All the streets are made of cobblestones and narrow. Every building looks very old. The entire Old Town is just like one giant maze. Latvian RIGA, city and capital of Latvia, on both banks of the Western Dvina River, 9 miles (15 km) above its mouth on the Gulf of Riga. An ancient settlement of the Livs where the Ridzene River joins the Western Dvina, Riga was founded in 1201 by Bishop Albert I of Livonia, who had landed at the mouth of the Western Dvina two years earlier with 23 ships of crusaders. He made Riga the seat of his bishopric (raised to an archbishopric in 1253) and founded there the Brothers of the Sword (1201; attached as a branch unit to the Teutonic Knights in 1237). Riga joined the Hanseatic League in 1282 and became one of the most important centres of trade on the Baltic. 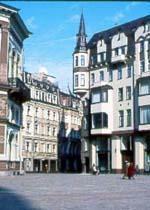 Its episcopal privileges allowed the town to act with considerable independence; but on the dissolution of the Teutonic Knights in 1561, the surrounding territory passed to Poland, and Riga itself passed to Poland in 1581. In 1621 Gustavus II Adolphus of Sweden captured Riga, but both Poles and Swedes granted Riga autonomy of government. In 1709-10 the Russians took Riga, and Sweden formally ceded the city by the Treaty of Nystad in 1721. Under Russian rule, its trade grew considerably. The zone described in the World Heritage listing is very large. It includes the medieval centre, the old eighteenth and nineteenth century suburbs that were laid out on a grid plan, and a semi-circle of boulevards dating from the nineteenth century. 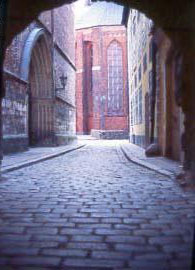 From the thirteenth century the majority of Riga’s buildings were stone, reflecting the wealth of the medieval city. The old city has conserved many of these buildings with their narrow façades, such as the fifteenth century “House of the Three Brothers.” There are several medieval churches in the old city. The cathedral, begun in 1211, was subject to numerous additions and renovations in the late Middle Ages and the modern era, which explains the mix of Roman, Gothic, Mannerist, Baroque, Classical and Neolithic elements to be seen in it today. Another medieval church, dedicated to Saint Peter, was badly damaged during World War II but its remarkable spire still marks the city’s skyline. As in many European towns, the medieval ramparts were pulled down in the mid nineteenth century. They were replaced with an extensive belt of boulevards and public gardens that surround most of the old city. At the end of the twentieth century, new suburbs were built according to a grid plan, and many splendid Art Nouveau mansions were built. Latvian architects, who were influenced by Finland, brought an original touch to this style which gave birth to movement of romantic nationalism. The historic centre of Riga includes elements from every historical era, all of which form a priceless treasure of urban heritage.